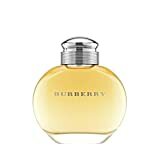 Burberry for Women Eau de Parfum is a fresh and sensual fragrance. The scent features fruity top notes of blackcurrant, fresh green apple and bright bergamot. Heart notes of cedar wood, jasmine, moss are intensified with warm notes of sandalwood for a rich and sensual tone. Warm notes of musk and vanilla smooth the base.